The Tilghman-Rockey report (TRR; 1) responded to the NIH’s request for advice about how to devise a sustainable infrastructure and workforce for US biomedical research in the 21st century. As I showed in six BiomedWatch posts (2-7), the TRR seemed almost not to notice the hand-writing on the wall. In addition to pointing out the TRR’s inadequacies, I proposed measures designed to achieve the kind of sustainability sought by the NIH. Daunted by mind-boggling details, some readers will plead for short summaries of problems and proposed remedies. 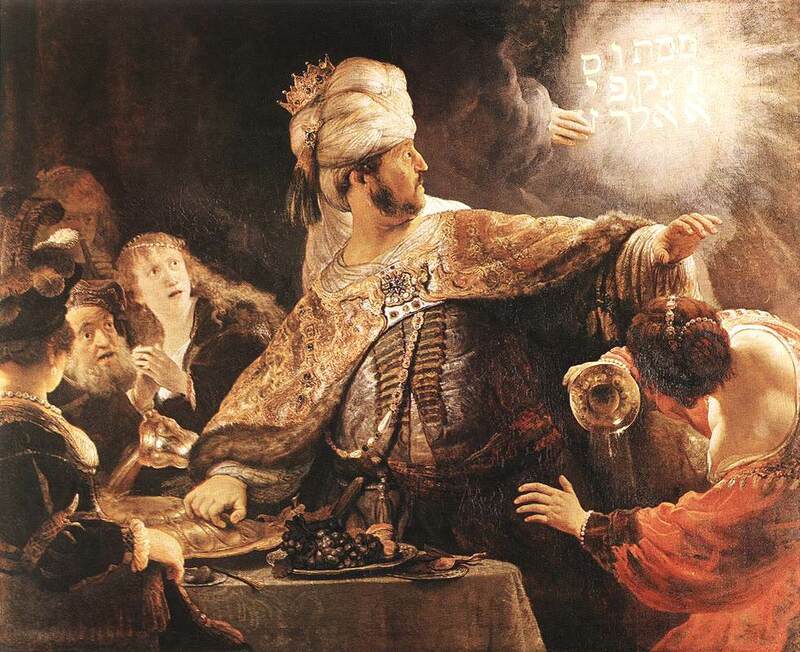 Others, blessed with enough Sitzfleisch to digest the whole convoluted story, ask how to implement multi-faceted remedies in the midst of our political and economic morass. For brevity’s sake, I’ll summarize the proposals and discuss their implementation separately, focusing today on problems and solution, and deferring implementation to the next post. Sadly, the US biomedical research enterprise in its present form is not sustainable. Decades of unchecked growth have created a giant too blinkered by past success to recognize scary plagues—expansionism, reduced enthusiasm for science in the US, and tough questions about goals and priorities, as well as economic recession and political gridlock—and too stiff-necked and ham-fisted to cope nimbly when those plagues threaten its destruction. Only by boldly taking charge of our own destinies can we devise effective remedies. First, we must clearly define the problems. The core problem (see 8) is rampant expansion of the biomedical research enterprise in American research universities. This enterprise needs a new business model able to gently apply brakes to expansionism and direct it toward crucial goals. The TRR managed to ignore the profound effects of expansionism on the biomedical workforce (see two BiomedWatch posts: 8, 9), but did wave its hands, a bit half-heartedly, toward one major accelerant to expansion: soft-money salaries for faculty researchers. In addition to diverting research money into PI salaries, soft money salaries pose dangerous financial risks for both institutions and faculty, threaten collegiality, destabilize teaching commitments, and discourage PIs from tackling innovative but risky projects that are not guaranteed to put food on the table. Consequently, I propose (see Table, proposals 1, 3) that NIH set quantitative targets for reducing soft-money salaries and act decisively to reduce them. This is one of several much-needed brakes that can slow irresponsible expansion (3, 8, 9). I leave these brakes, and other dangers of expansionism, to another day (10). Abbreviations include: MS, Master of Science degree; TG, training grant; RPG, research project grant; PCIG, Postdoctoral Career and Instruction Grant. To control and re-direct expansion of biomedical research, a sustainable business model must regulate both quality and size of the biomedical workforce. The TRR found that growth of the biomedical workforce—especially the postdoc population—is uncontrolled, and were dismayed to discover that no one can accurately estimate the size of the workforce or rates at which PhDs pass through different pipelines in the system (11). Decades ago, the NIH sought to improve the quality of biomedical training, to which it devoted 15% of its extramural budget in 1980; in 2012, less than 3% of that budget is spent on training (12). Eight of my proposals are designed to enhance the quality and gain control over the numbers of PhD students and postdocs in the biomedical research workforce (see, respectively, proposals 2-4 and 5-9 in Table). Why is controlling the quality and numbers of PhD graduates and postdocs in the workforce so critical? One reason, especially critical in lean economic times, is that it is wasteful to produce only one permanently employed researcher from every three to four students who matriculate in PhD-granting programs 10-12 years earlier (13). Second, the market for skilled lab scientists depends on how economic, political, and scientific balls bounce. Scientists see vast new frontiers in need of exploration, while Congress, drug companies, and markets may perceive more or less need for basic research, or decide—as Martin Rosenberg argues (14)—that industry needs relatively more innovative people with skills unrelated to laboratory science. Third is the postdoc holding tank, brimming with young scientists who wait for permanent research positions (6), which: (i) confines smart young people to dependent jobs when they could be more productive as permanent employees; (ii) depresses the market for PhDs, dissuading the brightest young would-be scientists from contemplating biomedical research as a career; (iii) provides cheap labor for large academic labs, further aggrandizing senior scientists (the graying professoriate) and making it harder for young people to find academic jobs. More agile regulation of production of new scientists would reduce waste, facilitate quicker responses to unanticipated changes in the PhD market, and drain the postdoc holding tank. My proposals for PhD training fall into two groups. Proposal 2 (see Table) aims to reform the PhD by sharpening its focus on research training, better inform potential PhD students about the prospects and rigors of biomedical research, and institute a mandatory Master of Science degree as a branch-point for students to commit themselves either to lab research or to science-related careers not engaged in research (see 4). Proposal 3 switches responsibility for paying graduate student stipends exclusively to training grants (TGs) rather than research project grants (RPGs). This switch recognizes the primacy of training and, more important, will make it possible both to know and to control the numbers of NIH-supported PhD students in a fashion independent of RPG support (5, 15). Proposal 4 (see Table and 5, 16) will furnish NIH a valuable perspective over the quality and training of PhD students supported by non-federal funds and will also provide more accurate information about their progress, tracked after award of the PhD. These three proposals (like the weaker proposals of the TRR) do not prescribe an arbitrary limit on the number of PhDs to be awarded, but (unlike the TRR’s proposals) set the stage for regulating that number if and when such regulation proves useful. The five proposals for postdocs also divide into two groups (see Table and 7). Proposals 5 and 6 aim at improving quality and monitoring progress of postdocs. The first defines NIH-supported postdocs as primarily workers in the lab and secondarily as trainees for an optional, narrowly targeted purpose (scientific communication), while the second sets up Postdoctoral Career and Instruction Grants (PCIGs) for tracking, instructing, and evaluating postdocs. 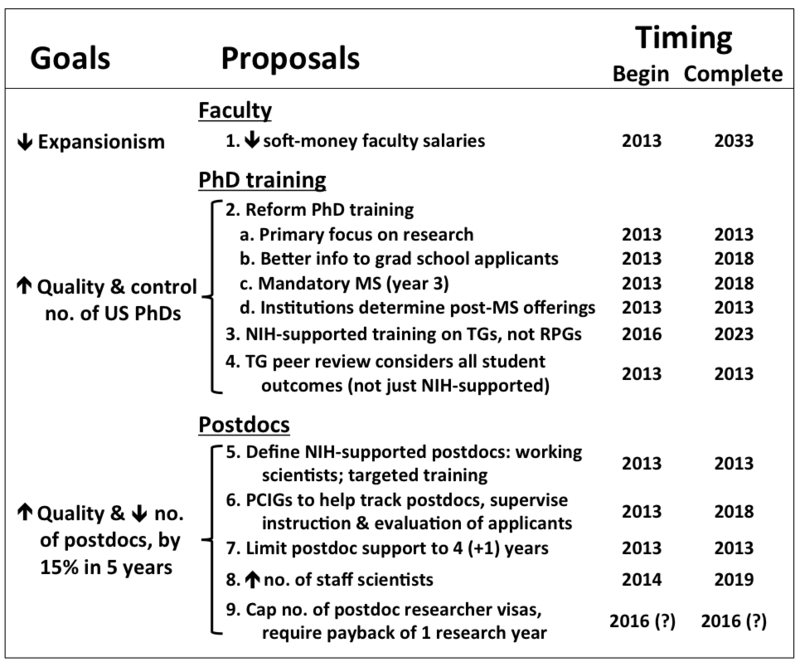 Taken together, proposals 7, 8, and 9 are designed to effect a modest decrease in the size of the postdoctoral holding tank (7) by limiting NIH postdoctoral support to a maximum of five years, providing incentives for PIs to substitute NIH-supported staff scientists for some postdocs, and capping the number of visas awarded to foreign postdocs in US academic laboratories (17). If each proposal reduces the size of the postdoc holding tank by 5% within five years, the holding tank will shrink by 15%. The Table also shows my guesses at the year when implementation of each proposal could begin, and the year when it might be complete. Thus reduction in faculty salaries could begin as soon as NIH decides to require that all faculty who receive salary support from NIH grants receive at least 5% of their salary from university sources, but the process may require another 20 years to become “complete” (i.e., all faculty receive at least 50% of their salary from their home institution). While several proposals (numbers 2a, 2d, 4, 5, and 7) can be implemented within a single year (assuming NIH has the requisite will to do so), others will take longer because they are more complex and/or require participation of additional stakeholders, as I shall discuss in my next post. For instance, proposals 2b, 2c, 6, and 8 could begin soon, but substantial progress in each case would probably take five or more years, because each requires a collaborative effort involving both research institutions and the NIH. Proposal 3, as I explained earlier (5-7), will require a year or more of negotiation between NIH and institutions that train graduate students, followed by the six or seven years necessary for all RPG-supported graduate students to graduate and be replaced by students supported by TGs. Finally, implementation of proposal 9 may take a very long time, because it requires coordinated actions of institutions, PIs, the NIH, other government agencies, and Congress itself (also discussed in the next post). I enthusiastically stress that none of these proposals is original or extraordinary. Indeed, for all my animadversions vis-à-vis the TRR, that wishy-washy document contains germs of several of my proposals. But there is a crucial difference: carrying out the TRR’s recommendations will produce little or no effect, for good or bad; in contrast, putting the BiomedWatch proposals into effect will profoundly change the academic component of the US biomedical research enterprise. The result will be a more efficient system that can provide better training for young scientists, measure the need for changes in the size or composition of its workforce, and then make those changes happen. My next and (I promise) last post on the TRR will describe how to meet the enormous challenge of implementing the nine proposals outlined here. 1. Biomedical Research Workforce Working Group Report. Pdf here. 2. The biomedical workforce report (TRR-I). 3. A flood of soft-money salaries (TRR-II). 4. Is PhD training too narrow? (TRR-III). 5. NIH support for PhD training (TRR-IV). 7. The postdoc holding tank (TRR-VI). 8. Why ignore those icebergs? (I). 9. Why ignore those icebergs? (II). 10. For instance, a viable new business model for biomedical research will also grapple with a peer review system over-burdened with myriad applications, graying of the research professoriate, and tough choices about research goals and priorities. 13. The TRR (p 32) estimated that of about 16,000 matriculants in biomedical PhD programs, only 9,000 graduate with a PhD, and of these less than 6,000 do postdoctoral research. A substantial proportion of these (25-33%) take up careers in fields that do not involve research, although they may be science-related. 14. M Rosenberg, An honorable career in academia vs. an alternative career in the private sector. ASBMB Today, August 2012, pp 12-13. 15. By switching NIH-supported PhD stipends from RPGs to TGs, proposal 3 allows NIH and Congress to control funds appropriated for RPGs and TGs independently from one another. 16. By requiring peer review of NIH TGs to consider outcomes of all PhD training (not just that supported by the NIH TG under review), proposal 4 enables the NIH to track subsequent careers of all US-produced biomedical PhDs, making it much easier to estimate needs for more or fewer biomedical scientists. Thus a need for more such scientists can trigger an appropriate increase in training funds, followed a few years later by a parallel increase in funds appropriated to pay for research in their new laboratories. A need for fewer scientists would trigger the opposite scenario. 17. In addition to capping the number of postdoctoral visas, proposal 9 also requires that foreign postdocs paid from NIH RPGs “pay back” their postdoctoral stipend by serving for one year in a permanent research position in the US afterward. This provision should increase the likelihood that US-trained foreign postdocs contribute significant skills to US science.